About the author: Paul Santisi has quickly become one the most listened to authors in the World in the areas of meditation, self empowerment and spiritual awakening. 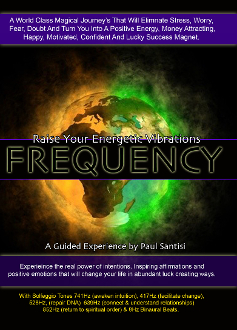 With a growing audience in the countless millions of people in every country in the World, Paul Santisi audios are some of the most effective, eye opening, soul expanding recordings ever published! This is the audio that started it all! Enter a state of deep relaxation as you raise your energetic vibration. Combined with calming and soothing music, ancient solfeggio tones, binaural beats and hundreds of pure positive feel good affirmations that will change your body's frequency and positive energetic vibrations automatically just by listening.